Taking you on a dreamy meadow where a windmill spreads Super Lines, Multpiliers and Super 5 Win, 3 Charms Crush by iSoftBet is a 5-reel 5-row 5-payline slot machine with a calming and relaxing atmosphere. You can also win a 500-coin jackpot if play your cards right, so read the 3 Charms Crush slot review to learn how to win this interesting prize. Want to see how 3 Charms Crush works? Select a recommended casino site from the list below and start playing for free or real – our screenshots will give you a sneak peek! Your first choice would be to decide whether to play for fun or for the real money. To receive an actual prize, players have to line 3 or more symbols of the same kind appearing on the paytable. 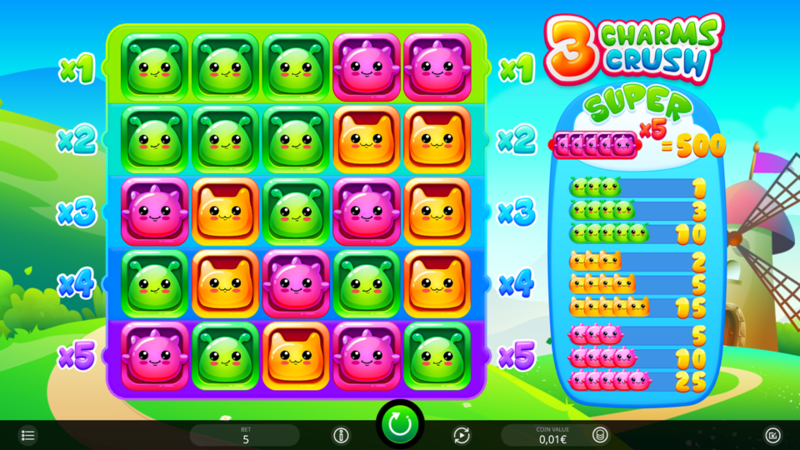 Red charm cutie has the highest rating and pays up to 25 coins in the base game in case you collect 5 of a kind. The coin value ranges between €0.01 and €1, allowing each player to define his own strategy and wager between €0.05 and €5 per round. Just note that each spin costs 5x selected coin value. There are 5 fixed paying lines, but each one has a different Multiplier associated with it. Practically, line 1 pays 1x, line 2 doubles your winnings and so on until the final reel that comes with a 5x Multiplier. You can also play for a predefined number of times without any interruption thanks to the Autoplay mode. Even though there is no special 3 Charms Crush Bonus, you can still land a big win if manage to collect 5 red cuties on the reel 5. Instead of a standard multiplier, the winners will receive 20x applied to the maximum possible coin streak and claim a 500-coin jackpot. You can play online around the sites powered by iSoftBet directly on your mobile device. This also means you won’t have to download an app for Android or iPhone. 3. What is the RTP factor of 3 Charms Crush? According to the info we got from the official source, this title comes with the RTP of 97.23%. Your search for a calm and relaxing game could be over right here, but try not to be too surprised if a 500-coin jackpot makes your heart beats. The game favors players over the house and compensates the absence of 3 Charms Crush free spins easily.